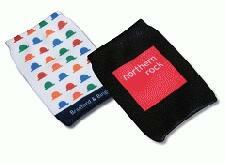 How about a nice luxury pair or promoting socks - FULL COLOUR print - ALL OVER the sock to expose your company name?! Yes - thats right, - we have 'em - Our Socks with Logo will make a dazzling impression and at the same time your promoting your company brand name, making a profound impression on customers and clients alike. Future business is a definite, so make a difference and spread the word, your company deserves advertising so make sure you do it in style!! Have a picture of your company logo, or the brand name and some text. our choice - your customisation and your personalisation. And these are totally custom and tailored to your need. Why not send out some Socks with logo as a good-will gesture or business geift - the perfect corporate strategy to promote with urban fashion.